Minna Hakalahti showed a photo from a waterfall to illustrate her research on a process to capture heavy metal ions from water. The performance gave her the first prize in a three-minute presentation competition. A workshop with three-minute presentations, 3MT, was introduced in the Young Researchers’ Program during the celebrations of the 2016 Marcus Wallenberg Prize. The attempt was such a success, that it was repeated also this year. The 2017 MWP Young Researchers’ Program took place at the end of October in Stockholm, Sweden, where 36 PhD students and post docs from Canada, Finland, Sweden and USA were invited. All the participants presented their work in both posters and 3MT-presentations. 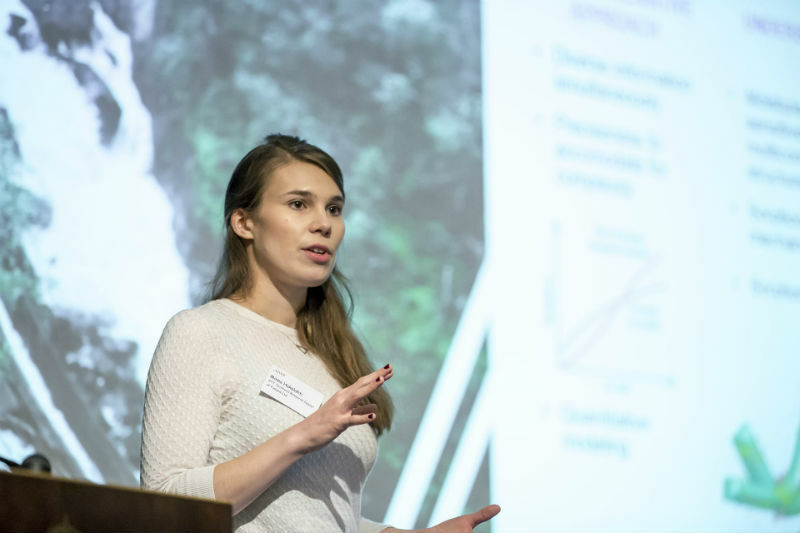 Minna Hakalahti, PhD at VTT Technical Research Centre in Finland, presented her research on developing films from wood-originating nanocellulose to catch very small particles and ions from water. She chose a picture of a waterfall near her cottage in Finland to make the audience interested. – I decided to show something that has a relevance to everyone and a story that everyone could follow, Minna Hakalahti says. Preparing words and image was a rewarding experience. – As researchers we are more frequently asked to communicate our work in a very compact and concise way. Here the time limit forced me to think about what was the most important message I wanted to convey, she says. It was also instructive to watch other contributions. – I saw some beautiful and effective illustrations that supported the message very well. Overall the best presentations were quite simple, avoided complicated terminology and had a good storyline, she says. 3MT-presentations is an academic competition to encourage presentation and communication skills. The idea was founded by the University of Queensland in 2008 and has spread to hundreds of universities worldwide. The 2017 MWP Young Researchers’ Program had instructed the participants to use only one static slide to set the scene, and their elevator speech was supposed to summarise their topics to fellow scientists. The session was moderated by Professor Jack Saddler, University of British Columbia. He is a member of the MWP Selection Committee, which constituted the 3MT-jury. All the participating junior scientists also picked their choice in a joint panel. The three best presentations were ranked as being at the top by both selection groups. Minna Hakalahti was awarded the first prize, 5 000 SEK. – She was able to convey a real sense of enthusiasm, insightfulness and intellect in her presentation, Jack Saddler says. Jonas Wetterling, PhD in chemical engineering at Chalmers University of Technology, Göteborg, Sweden, was second best according to the jury. He received 3 000 SEK. 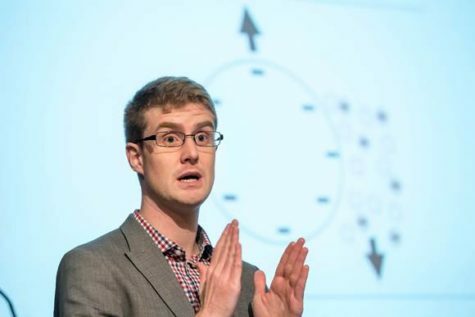 The runner-up was Jonas Wetterling according to both jurys during the 3MT workshop. Jonas Wetterling studies how electric fields can decrease the energy demand when cellulose nanoparticles are separated from water. Cellulose nanoparticles can be used to create a wide range of materials including films, hydrogels, foams or components in composite materials. In his presentation Jonas Wetterling explained how his research can contribute to overcoming a key obstacle involved in scaling up from a laboratory level to a commercial production. – I believe that preparing a 3MT-presentation is a very useful exercise. The short presentation time allows you to focus only on a few key points. It is often easy to get lost in the details, but this format allows us to focus on what we are trying to accomplish and why, Jonas Wetterling says. 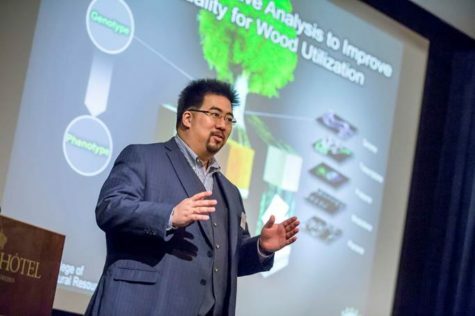 Jack P. Wang, PhD at North Carolina State University, USA, was awarded third prize in the 3MT competition and received 2 000 SEK. Jack Saddler thinks the standard of the presentations has increased since last year. – Even a wider audience would probably appreciate being educated by this group of young researchers. They have condensed several years of blood-sweat-and tears to help define what will constitute the future, global forest sector, says Jack Saddler. Jack P. Wang was awarded third prize in the 3MT competition during the Young Researchers’ Program.